The Bernardino de Ribera whose works are recorded here, all but one for the first time, is all but unknown; he is not to be confused with the Spanish-Mexican composer Bernardino de Ribera Sahagún. He was active in the city of Toledo, Spain, a generation before Tomás Luis de Victoria, whom he taught and influenced. His obscurity is due to vandalism rather than to any issue of musical quality: the splendid manuscript that forms the main source for his music was cut up by someone who wanted the illuminations, and on the reverse of those were many sections of Ribera's works. Some have been lost for good, but others were susceptible to reconstruction by Bruno Turner, the annotator of the present recording by the fine, all-male choir De Profundis. It's a fair bet that if you like Victoria or Guerrero, you will be delighted to add this album to your shelf or hard drive. The overall mood is dark and highly expressive, with influences coming directly from Netherlandish composers like Josquin and his successor Nicolas Gombert. 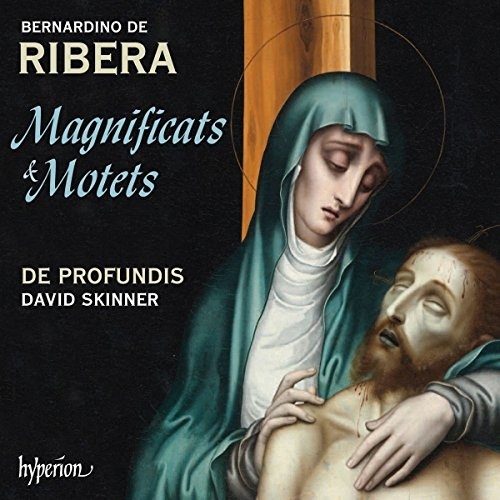 Sample the low, beautifully balanced "Beata mater" or "Vox in Rama", with its passionate depiction of the despairing Rachel, and you may well be hooked. The two Magnificat settings are also major entries in the genre, and Hyperion's sound, recorded at Cambridge's St George's Church, is almost tactile. Highly recommended.